Beauty is the size of your heart, not the size of your jeans. Beauty is within not on the outside! It's nice to try to beautiful on the outside, but being beautiful on the inside is more important. Totally true! Doesn't matter what size or shape you are. Beauty is in the eye of the Beholder!! what is in the heart is the most important Thing in life not size or shape in any form it's in the inside that counts God put this there ! Your heart says inside brings out the best of you on the outside size should not matter. 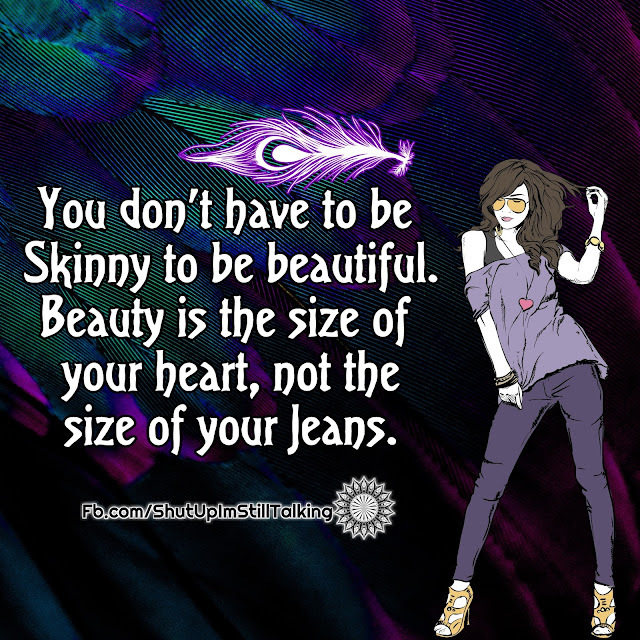 Beauty is the size of your Heart picture/image is an Inspirational Stuff to Inspire and Motivate You. You can download pics by just clicking on the Images. Thanks for visiting Truth Follower an online place for huge collection of inspiring pictures, quotation, and Sayings Images. If you like Beauty is the size of your Heart , Please Share with friends and family on Facebook, Twitter, and Pinterest.